'Flowers' was a trial range produced by Timothy Harris and Carl Nordbruch of which ten pieces are known, including eight vases and two perfume bottles. All the pieces were of a different shape and size. These were made to trial a new process of building up the design part by part and layer by layer after blowing the initial colour-cased gather into a ribbed mould. The flowers were formed part at a time after which the whole piece was finally heavily cased in clear glass. However, it became too time consuming to be commercial, which explains why there are only a handful of examples. 'Flowers' was only available at the IOW Studio and were not generally issued. Some (we believe four items) were kept by the Harris family in the Studio archives and only sold in 2009.
mainly white with light blue and pinkish purple flowers of which only a single vase is known. 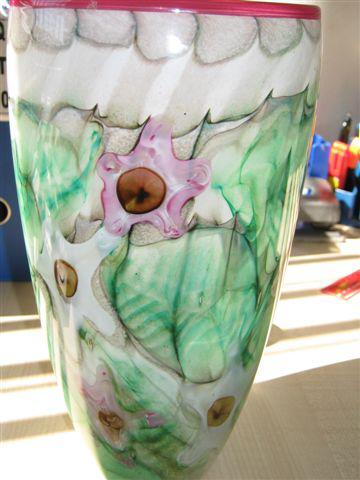 This vase is signed "Timothy Harris Isle of Wight Glass England 1993". 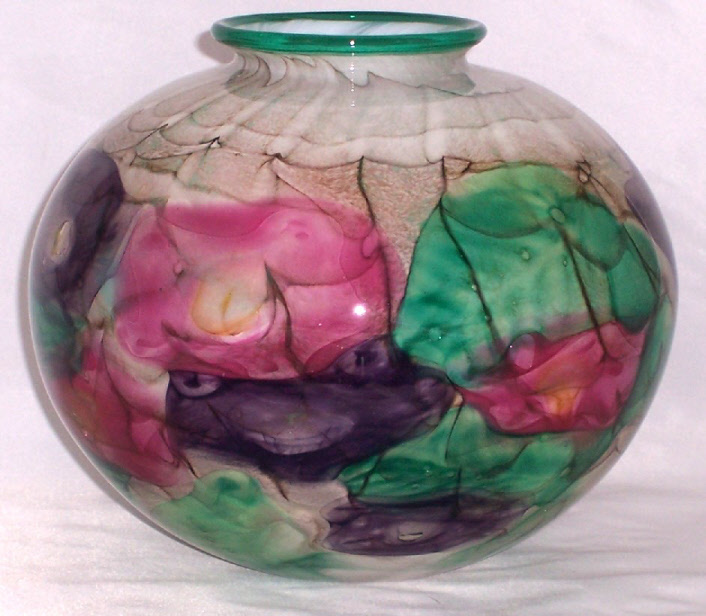 The vase is 13.5 cm high and 13.5 cm in diameter. 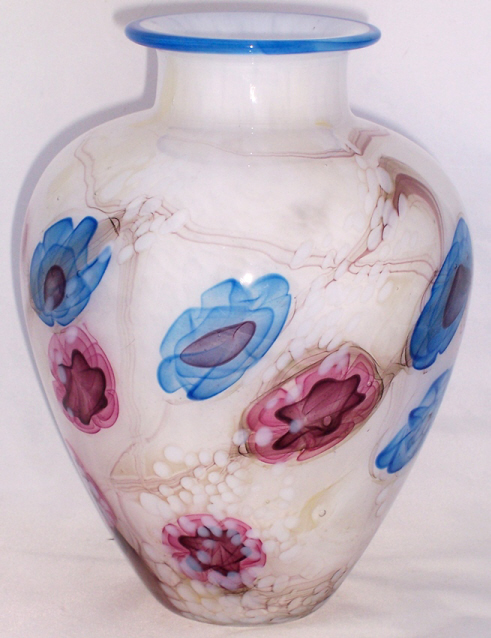 This vase is signed "Timothy Harris IOW Glass England '94". It is 27 cm tall and 14 cm across at the top rim. Perfume bottle signed "Timothy Harris IOW Glass England 94". It is 15.0 cm high and 7.5 cm diameter at the widest point. Image courtesy of Richard Price. 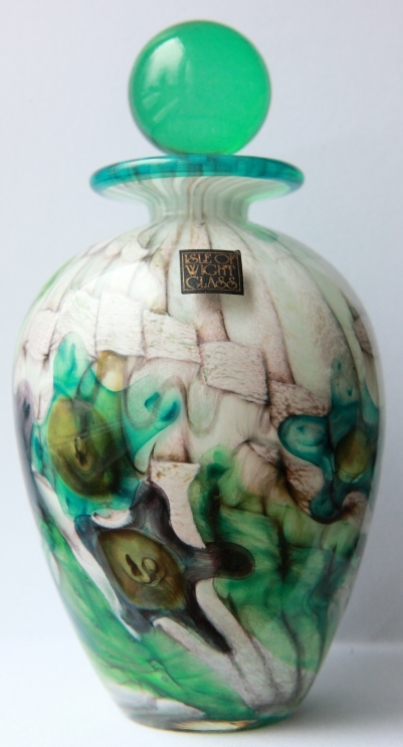 This vase is signed to the base "Timothy Harris Isle of Wight Studio Glass 1994". 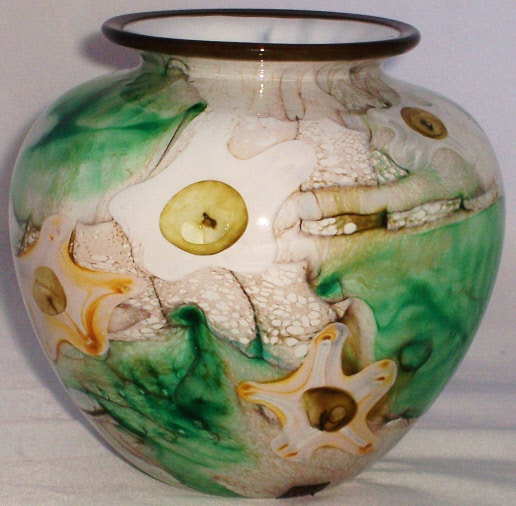 The vase is 17 cm high and 19.5 cm in diameter. Two vases of this colourway were offered for sale by Bonhams auction house in May 2009. The base is engraved with 'Isle of Wight Glass England 1993' written in Timothy Harris's hand. Timothy reckons that this piece must have been made by Carl Nordbruch when he worked at the Studio as he doesn't recall making it personally (personal communication). Image courtesy of Artius Glass.